Head Razzle Dazzle 94cm 2018/19 Skiboards with Tyrolia Ski Bindings provide high performance fun on the slopes with the perfect combination of control and maneuverability all in one package. 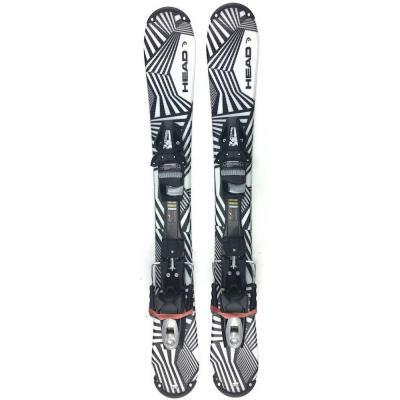 Head Razzle Dazzle 94cm 2018/19 Skiboards with Tyrolia Ski Bindings provide high performance fun on the slopes with the perfect combination of control and maneuverability all in one package. High quality construction, including graphite bases, along with pre-mounted Head/Tyrolia Sympro 100 Release Bindings and brakes make this a winner every season. 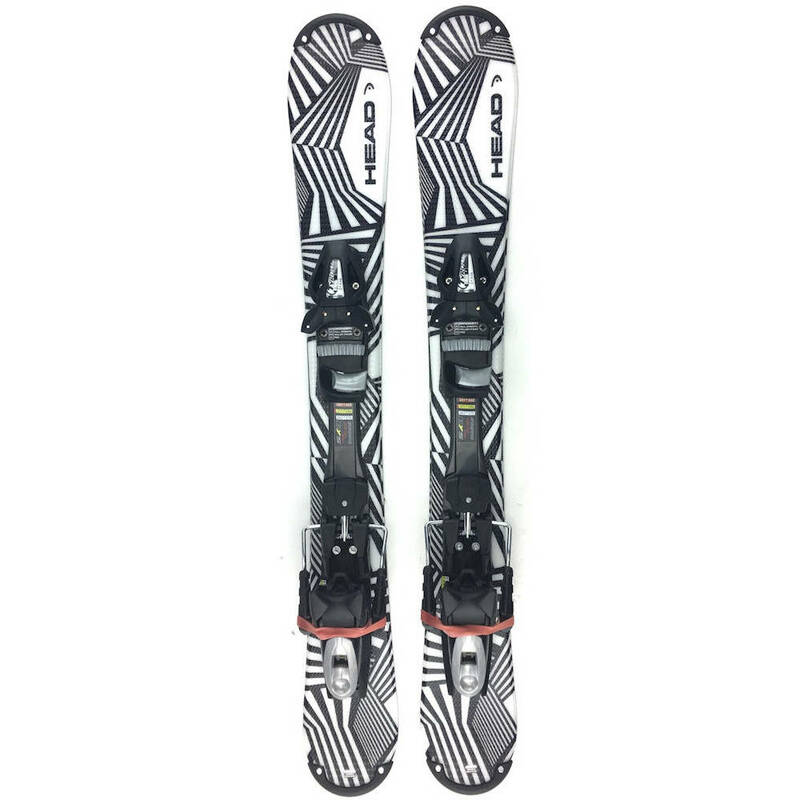 The Head Razzle Dazzle 94cm 2018/19 Skiboards with Tyrolia Ski Bindings is super easy to ride whether cruising the groomed runs, fast turns in the moguls or even taking on the black diamond advanced terrain with complete confidence. The wider-body construction coupled with a deep parabolic side cut makes carving, whether a beginner or seasoned skiboarder, almost effortless. This is especially so due to the slightly narrower tail width that makes turning even easier as it is super easy to kick that tail around. These will amaze you with how stable and smooth they ride. The Head 94 comes with an asymmetrical twin tip design for ease of forward and backward riding. The graphite bases plus a specially formulated composite construction and “snake-skin” protective top sheet make these one of the most versatile and longest lasting skiboards on the market. The graphite base provides the speed you need and the right combination of wood core and parabolic shape means easy lay-it-down carves with the stability you would normally expect in boards much longer. In addition, front and rear tip protectors protect your tips from those unexpected knocks and dings. Head has gained a deserved reputation for making high quality, high performance, often revolutionary ski and sports equipment and the new Head94 is no exception. If you are still lingering on the sidelines of our sport, waiting for skiboards with releasable bindings that feel like your skis, but way better, stop waiting and start riding! Recommended for: Beginners wanting to learn to ride or perfect their snow riding skills. With the Head 94cm fun and quick success are already pre-programmed. Free from norms and constraints, you can learn to ride much more easily and in a fun way without skimping on safety and quality. Also for Intermediate riders looking for skiboards that feature the convenience of step-in-and-go bindings, plus the added safety of release bindings, while not compromising high end quality construction and an asymmetrical twin-tip design for more aggressive riding. Bindings: Release bindings adjust without tools to your ski boots. Just set the release factor (DIN) and off you go. The Tyrolia Sympro bindings feature a unique anti blocking system (ABS) which allows the boot to literally glide out of the binding with practically no friction. It also puts significantly less load on the knees and ligaments especially in forward twisting falls. 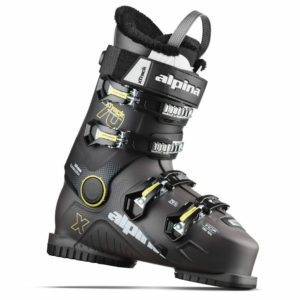 Skiboarder safety and the constant release values are unaffected by ice-up, dirt or boot wear. The system is self-cleaning. The SP100 bindings sport a 4 roller pincer system with low friction inserts (TRP). This ensures a 180 degree release, a quick return to the initial set position along with an exact boot re-centering upon reentry. This feature also offers a 30% higher retention force with programmed shock-absorption that withstands brief, intense impacts and reduces peak loads on knees and ligaments (shock control). 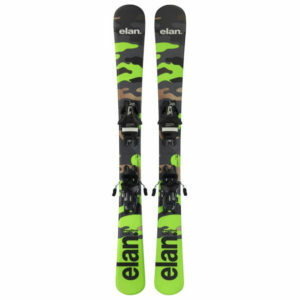 These bindings allow for both heel and toe to be length-adjusted with a single motion of the hand using easy-adjust forward and back sliding plates. The heel flap features an adjustment window for setting the release values in any position, thus eliminating any extra movement of the heel. Tyrolia SP100 Bindings Din Range = 3 to 10. Fits ski boot sizes 5 to 14 US (263-391mm). 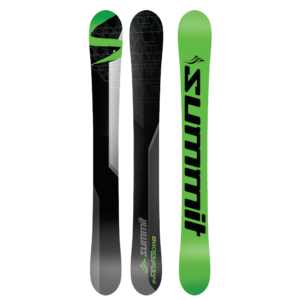 NOTE: Also check out the new Summit EZ 95 cm skiboards (identical specs, higher quality construction, great performance, and ride similar to Head Razzle Dazzle). Cap, composite construction, snakeskin top sheet for extra top sheet protection. Graphite bases. Full wrap rockwell steel edges. Symmetrical twin tip. OK, these are the first skiboards I have every owned. I’ve been skiing my entire life and a us a ski around 170. I am an extremely fast skier and generally pass everyone on the slopes. I’ve been told skiboards are slower than skis. However, I was still passing everyone on the slopes with these boards. After my first run down the hill I was already an expert on these things. After a few runs I was able to ride a fakie. After a few hours of playing around I can fakie down the entire run. I’ve only used them on a two day trip so far because I bought them very late in the season. However, I plant to learn some tricks next season. I will never go back to long difficult to maneuver skis again. These boards are extremely easy to control and I spent all of my time skiing the most difficult diamond runs. Normally on skis I would be hesitant to ski the more difficult runs, but not with this babies!!!! I love these boards and highly recommend them to anyone looking for a high quality skiboard.